It’s hard for young network denizens to understand how it was back in the Olden Days, before the Internet. We had to choose an online information service, based on its culture and resources, and accept the fact that the boundaries between it and the others were at least as significant as those of the geographic kind (which were, ironically, becoming less relevant at the same time). 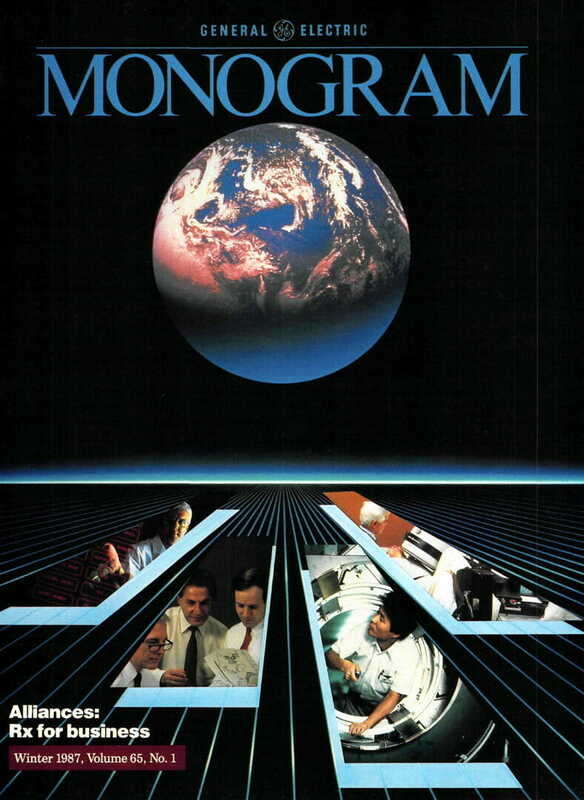 GEnie, CompuServe, Source, Delphi, AOL, and more… at various times, these communities were their own isolated worlds. Then the Internet came along, rendering centralized services obsolete. 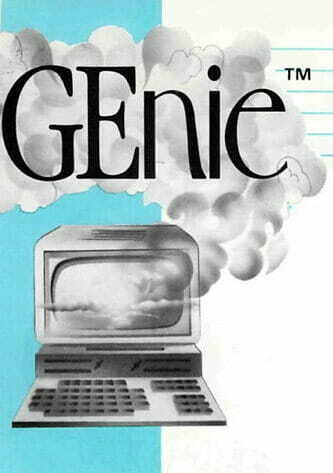 During my first 10,000 miles, I lived on CompuServe… then in 1986 things changed and I moved to GEnie for the next 6,000. As I traveled, I published an online column, stayed with fellow subscribers, and looked to the network for support and friendship. The articles reproduced here echo some of the sense of my relationship with the company… starting with departure from Bothell on October 15, 1986 (covered by CNN). 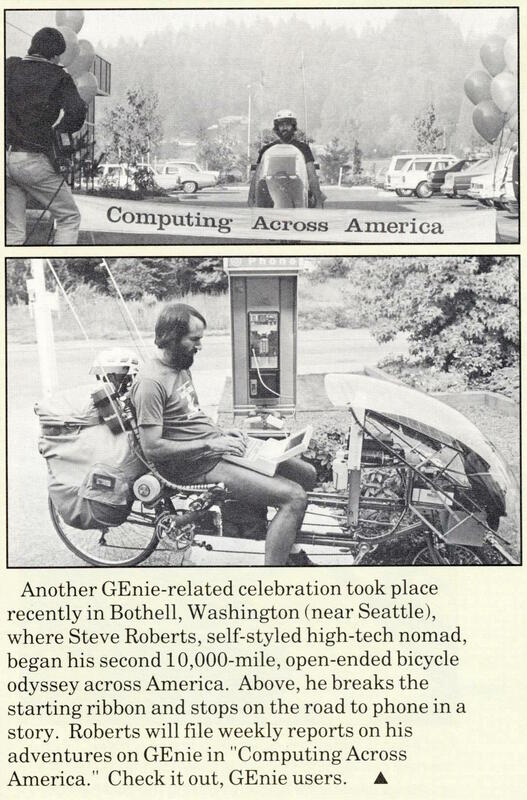 Steve Roberts, recumbent bicyclist and GEnie™ columnist, is a “self-styled high tech nomad.” In October 1986, he began his second 10,000 mile cross country journey from Bothell, Washington, outside Seattle, riding a custom-built, computer-equipped bicycle. Last month, after one year on the road, he pedaled to GE Information Services in Rockville, home of GEnie, to talk to local press and visit with the GEnie staff. Steve writes a regular column on GEnie, sharing his adventures with subscribers. A handlebar keyboard and a five computer network allow him to write while riding. “I snap thoughts on the fly and save them for later electronic transmission to friends or publishers anywhere in the world,” Steve says. 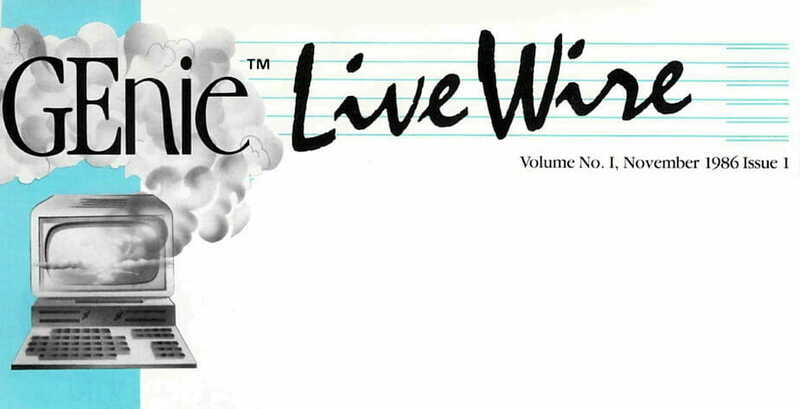 He welcomes responses, suggestions, and story ideas for his column. His GEnie address is WORDY — the same identification he has on his bicycle license plate. 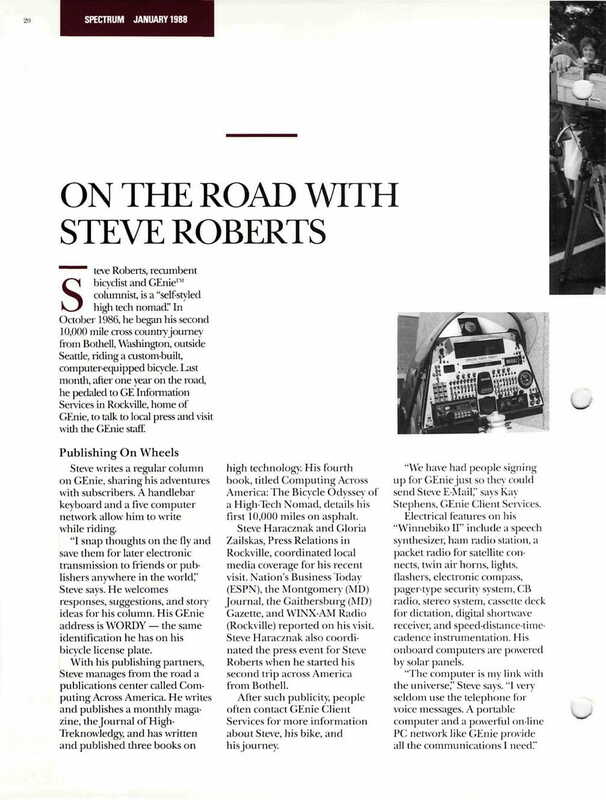 With his publishing partners, Steve manages from the road a publications center called Computing Across America. 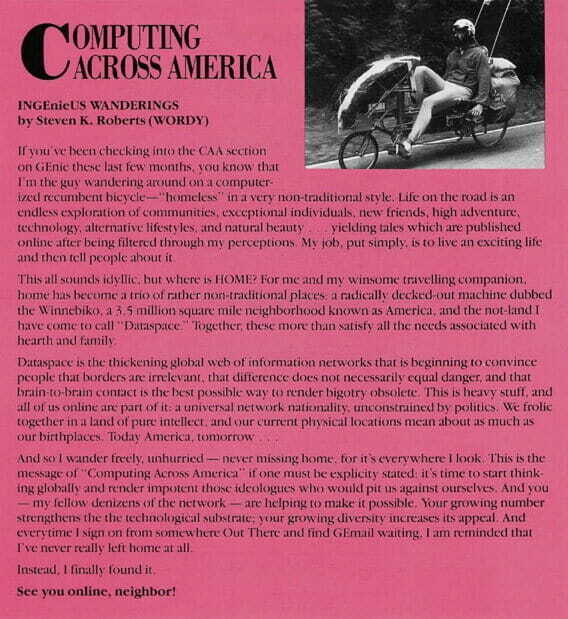 He writes and publishes a monthly magazine, the Journal of High Treknowledgy, and has written and published three books on high technology His fourth book, titled Computing Across America: The Bicycle Odyssey of a High-tech Nomad, details his first 10,000 miles on asphalt. Steve Haracznak and Gloria Zailskas, Press Relations in Rockville, coordinated local media coverage for his recent visit. Nation’s Business Today (ESPN), the Montgomery (MD) Journal, the Gaithersburg Gazette, and WINX-AM Radio (Rockville) reported on his visit. Steve Haracznak also coordinated the press event for Steve Roberts when he started his second trip across America from Bothell. After such publicity, people often contact GEnie Client Services for more information about Steve, his bike, and his journey. “‘We have had people signing up for GEnie just so they could send Steve E-Mail,” says Kay Stephens, GEnie Client Services. Electrical features on his “Winnebiko II” include a speech synthesizer, ham radio station, a packet radio for satellite connects, twin air horns, lights, flashers, electronic compass, pager-type security system, CB radio, stereo system, cassette deck for dictation, digital shortwave receiver, and speed-distance-time cadence instrumentation. His onboard computers are powered by solar panels. Steve and his traveling companion. Maggie Victor, who joined him in August 1986, use GEnie to check travel and weather conditions and operate a “hospitality database” for guest meals and accommodations when not staying in youth hostels, bed and breakfast houses, campsites, or with friends. “The first night out I was concerned about where we would sleep each night, but after I realized how nice people can be I didn’t worry anymore” Maggie says. She pulls about 200 pounds on her commercially built bicycle, carrying most of their life support items such as food and clothes. He carries all the electronic gear. 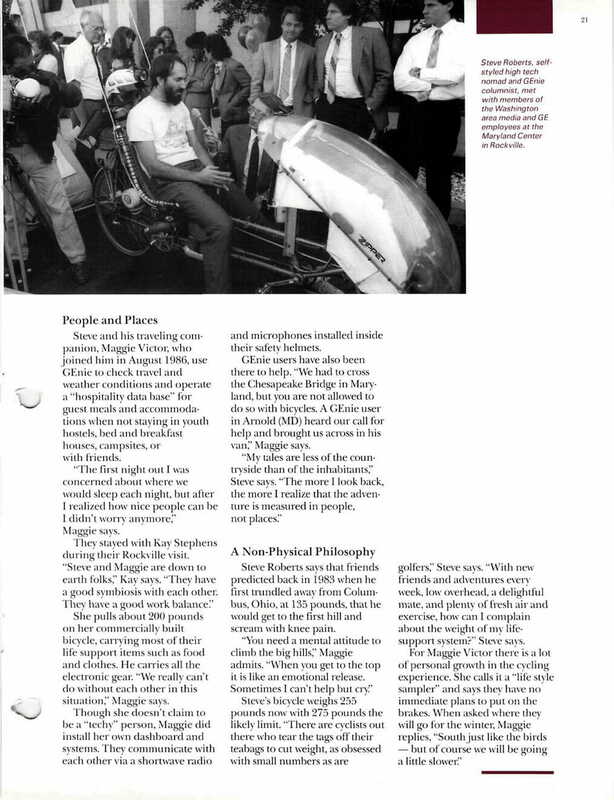 “We really can’t do without each other in this situation,” Maggie says. Though she doesn’t claim to be a “techy” person, Maggie did install her own dashboard and systems. They communicate with each other via a shortwave radio and microphones installed inside their safety helmets. GEnie users have also been there to help. “We had to cross the Chesapeake Bridge in Maryland, but you are not allowed to do so with bicycles. A GEnie user in Arnold (MD) heard our call for help and brought us across in his van,” Maggie says. Steve Roberts says that friends predicted back in 1983 when he first trundled away from Columbus, Ohio, at 135 pounds, that he would get to the first hill and scream with knee pain. Steve’s bicycle weighs 255 pounds now with 275 pounds the likely limit. “There are cyclists out there who tear the tags off their teabags to cut weight, as obsessed with small numbers as are golfers,” Steve says. “With new friends and adventures every week, low overhead, a delightful mate, and plenty of fresh air and exercise, how can I complain about the weight of my life-support system?” Steve says. 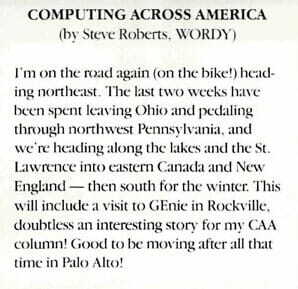 Steve Roberts, GEnie’s “Computing Across America” writer, left from Bothell, Washington on October 14 to begin his second 10,000-mile bicycle odyssey across America. More like a spaceship than a bicycle, the Winnebiko II has five on-board computers, a speech synthesizer, a ham radio station, satellite/packet data link, electronic compass, pager-type security system, stereo system, and a digital shortwave receiver. If you’ve been checking into the CAA section on GEnie these last few months, you know that I’m the guy wandering around on a computerized recumbent bicycle — “homeless” in a very non-traditional style. Life on the road is an endless exploration of communities, exceptional individuals, new friends, high adventure, technology, alternative lifestyles, and natural beauty… yielding tales which are published online after being filtered through my perceptions. My job, put simply, is to live an exciting life and then tell people about it. This all sounds idyllic, but where is HOME? For me and my winsome traveling companion, home has become a trio of rather non-traditional places: a radically decked-out machine dubbed the Winnebiko, a 3.5 million square-mile neighborhood known as America, and the not-land I have come to call “Dataspace.” Together, these more than satisfy all the needs associated with hearth and family. Dataspace is the thickening global web of information networks that is beginning to convince people that borders are irrelevant, that difference does not necessarily equal danger, and that brain-to-brain contact is the best possible way to render bigotry obsolete. This is heavy stuff, and all of us online are part of it: a universal network nationality, unconstrained by politics. We frolic together in a land of pure intellect, and our current physical locations mean about as much as our birthplaces. Today America, tomorrow . . .
And so I wander freely, unhurried — never missing home, for it’s everywhere I look. This is the message of “Computing Across America” if one must be explicitly stated: it’s time to start thinking globally and render impotent those ideologues who would pit us against ourselves. And you — my fellow denizens of the network — are helping to make it possible. Your growing number strengthens the the technological substrate; your growing diversity increases its appeal. And every time I sign on from somewhere Out There and find GEmail waiting, I am reminded that I’ve never really left home at all. Instead, I finally found it. If you haven’t been keeping up with Steve in his Computing Across America column, you have missed over 1200 miles and several months worth of adventures. Shortly after the start of the New Year, Steve left Eureka, California and headed south again. 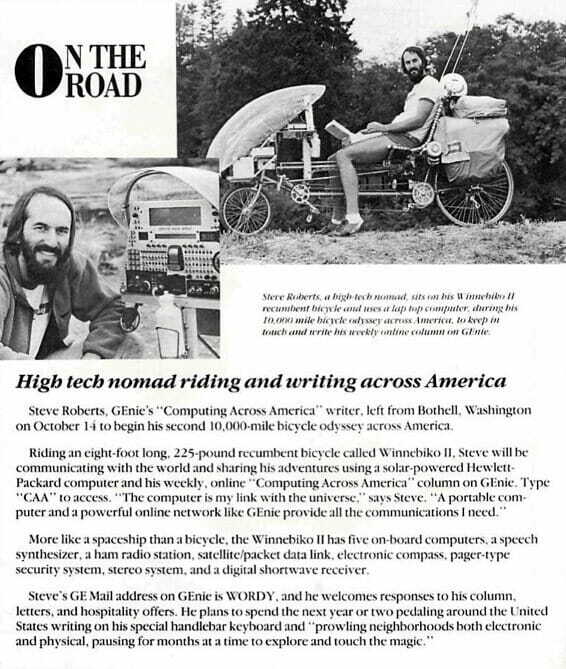 The big news is that Steve’s book about his first 10,000 mile adventure is coming out in February. Type CAA to see what’s been happening, or drop him a line at WORDY. Steve will appreciate it. I’m on the road again (on the bike!) heading northeast. The last two weeks have been spent leaving Ohio and pedaling through northwest Pennsylvania, and we’re heading along the lakes and the St. Lawrence into eastern Canada and New England — then south for the winter. This will include a visit to GEnie in Rockville. doubtless an interesting story for my CAA column! Good to be moving after all that time in Palo Alto! Hello from the Deep South! The Computing Across America adventure has just passed 15,000 miles, and continues now through the sunny southeast as we wait for the north to thaw. I’ve recovered from the Chapter 39 accident (“Blood in the Spokes”) and am playing with new bicycle-mobile ham radio equipment and an on-board packet BBS. 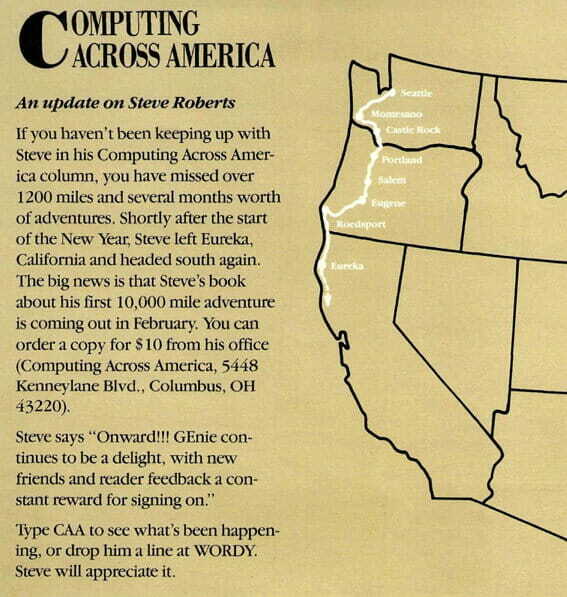 But the big news is the book: Computing Across America is being published at last in January, and it tells the strange tales of my first 10,000 miles of travel. Check CAA for ordering information, new technical articles, and the latest adventures! Steve Roberts, son of GE pensioner Ed Roberts, is currently pedaling across the United States on a recumbent bicycle. Outfitted with a lap-top computer that allows him to tap into GEnie,® a General Electric Information Services on-line network service, he files a weekly column about his adventures to more than 35,000 personal computer users. 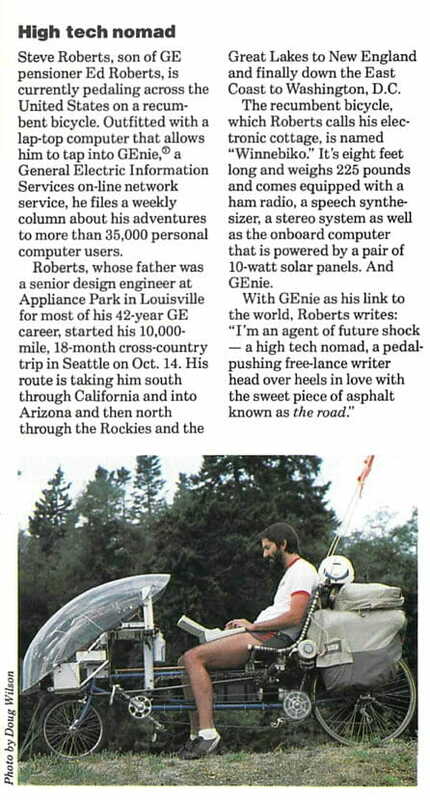 Roberts, whose father was a senior design engineer at Appliance Park in Louisville for most of his 42-year GE career, started his 10,000-mile, 18-month cross-country trip in Seattle on Oct. 14. His route is taking him south through California and into Arizona and then north through the Rockies and the Great Lakes to New England and finally down the East Coast to Washington, D.C. The recumbent bicycle, which Roberts calls his electronic cottage, is named “Winnebiko.” It’s eight feet long and weighs 225 pounds and comes equipped with a ham radio, a speech synthesizer, a stereo system as well as the on-board computer that is powered by a pair of 10-watt solar panels. And GEnie. With GEnie as his link to the world, Roberts writes: “I’m an agent of future shock — a high tech nomad, a pedal-pushing free-lance writer head over heels in love with the sweet piece of asphalt known as the road.